We have many students who take voice lessons at our school. 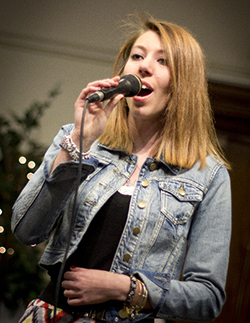 Our voice lessons are private one-on-one instruction. Twelve (12) years or older is the recommended age for students to begin 30 minute voice lessons. At this age the average student’s voice and lung capacity has developed to the point where they are ready for the exercises that are used to create proper vocal technique. Students age 6 and older who are interested in singing should enroll in Singing – Piano lesson combo (see below). 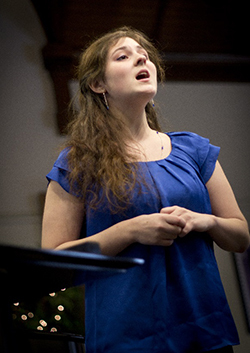 In Voice lessons students sing all kinds of music from their favorite artists to classical arias. Our voice teachers have university degrees in music specializing in voice and sing everything from pop and jazz to opera and broadway. Our teachers all have active performing careers as well. Here is just a sample of what a student will learn in voice lessons: How to breathe properly, how to increase vocal range, proper pitch, how to project, musical interpretation, exposure to different musical styles and stage presence. Our school offers 3 optional performance opportunities each year. Professional accompanists are available to rehearse with the student and play for them at the recitals. Contact Us Now for More Information.